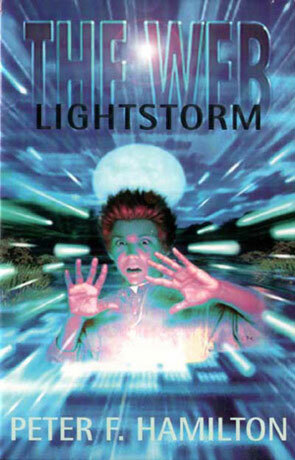 Lightstorm is part of the Young Adults Web Series of novels and has been written by Peter F Hamilton. Like MacLeods Cydonia, Lightstorm is part of Dolphins The Web series. All of the books take place in 2027 and the most of the books takes place online – in The Web. I’m not sure, but I think they are aimed a the pre-teens. Aynsley, sees some weird lights over the marsh next to his house and asks his online friends for some help. With a bit of help from Aynsleys old hacker uncle they soon find out that not all is well in the old (or rather new) marsh. But they have no evidences, so Aynsley will have to see if his online bravery is anything worth when it comes to the real world. This is a rather simple and straight forward story, but with a nice twist at the end. The moral is spelled out without any attempts at subtlety, which suits the style of the story quite well and makes it go down without too much nausea. It kept me entertained for all of its eighty pages (that’s including a small glossary for "webspeak"). Written on 9th April 2002 by TC.